I have to confess that for a long time I thought that lentil recipes were boring and tasteless…boy was I wrong! I was amazed at how delicious they are – my children love the dishes I make using them. They are really versatile and incredibly healthy. 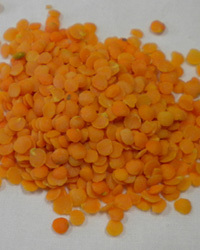 Lentils are one of our richest natural sources of folic acid which is essential for good health. They are also incredibly high in beta carotene which is a powerful anti-oxidant that destroys cancer- causing free radicals. I am so pleased to share two of my favourite lentil recipes with you. They are wonderful easy fast dinner recipes. So if you were like me and thought lentil recipes to be tasteless and boring, please give them a try – I’m sure you’ll be pleasantly surprised - I never knew lentil recipes could taste so good! When I first made this lentil stew recipe, I was amazed at how much my children loved it. Every now and then I need to make use of some quick dinner recipes for kids and this recipe has become part of them. 125g (bit over ½ c) red lentils, well rinsed and drained. 3t vegetable stock powder - see cook’s notes. 375ml (1 ½ c) water - you can add a bit less or more water to get it as thick or thin as you like. 1. Heat the oil in a large frying pan, then add the garlic and onion. Sauté gently for about 2 minutes. 2. Add the carrots and celery and cook for a further 5 minutes. 3. Add the lentils, stock powder, water and herbs to the pan and stir well. Allow the mixture to boil, uncovered, for about 10 minutes. 4. Place the tomatoes and tomato puree in the pan, cover and reduce the heat, then simmer for a further 15 – 20 minutes or until the stew is thick and the lentils are completely soft. 5. Season with black pepper. Try to find a good quality vegetable stock. Their strengths vary – the stock I use is 2t stock powder per 1 cup of water, so use your discretion there. For a bit of a variation, you can add some green, red or yellow pepper – this will add extra vitamins and add to the delicious flavour. I always add a teaspoon of fructose when I cook with tomatoes as this takes the edge off the acid. This is entirely optional. You may prefer to use normal sugar or to leave it out completely - it is entirely up to you. I love to serve this lentil stew with mung bean noodles (also called glass or bean noodles). You can also serve with rice noodles, whole wheat noodles, rice or potato…the options are endless! This is one of those easy supper recipes that are very simple to make, but because it is made with dried beans, takes about 2 hours to cook. If you are pushed for time, there is no shame at all in using canned beans…I love the convenience of canned goods! You can use whatever beans your heart desires here. 1. Soak the beans in water overnight or pour boiling water over the beans and soak for about 3 hours. 2. Fry the garlic and onions in the olive oil for a few minutes to soften. 3. Add the beans and stock and cook for about 1 ½ to 2 hours until the beans are soft. 4. Add the lentils and chopped vegetables and cook for a further 30 – 45 minutes until all the vegetables are soft. If you prefer a non-vegetarian option, you can use beef or chicken stock instead of vegetable stock. A delicious meaty alternative is to gently fry 200g chopped lean back bacon with the onions and garlic. If you prefer a bit of a curry flavour, try adding 1t ground cumin and ¼t mild curry powder to the garlic and onions just before adding the beans and stock. You can add sugar instead of fructose if you prefer. Fructose is ideal for diabetics and those on a weight-loss program because it releases energy slowly into the blood. Serve with mung bean (glass) noodles, rice noodles, whole-wheat pasta or brown rice and a side salad. If you love soup, here is an utterly comforting, scrummy and healthy lentil soup recipe you simply have to try. If you have some great lentil recipes you would like to share on this website, please click on this care to share? link to submit your recipe. I am always so thrilled to receive new and exciting healthy recipes.